The ZenWatch 2, shown off on fringes of Computex in Taipei June 1, could feature a four-day battery. A newly developed magnetic charger cable, seen here, connects to the back of the case. If the prospect of a flat battery before bedtime is turning you off smartwatches, the ZenWatch 2 from Asustek Computer might be a turn-on: Asus says it could last as long as four days on a single charge, with an optional external battery offering an additional half-day boost. The Taiwanese electronics maker took the wraps off a prototype of what will be the follow-up to its US$199 ZenWatch on the fringes of the Computex tech expo on Monday. But it held back on the specs, pricing and availability, saying the device hasn't been finalized yet. Echoing the looks of the Apple Watch and also incorporating a metal crown, the ZenWatch 2 is designed to be a fashion accessory, with two sizes of 49mm and 45mm, aimed at men and women respectively. It will be produced in three stainless steel case colors with 18 different strap and color combinations. The swipeable touch display is made from scratch-resistant Gorilla Glass 3 and the entire device is water-resistant. The original ZenWatch featured a Qualcomm Snapdragon 400 processor, 4GB of storage and a built-in microphone. Powered by Android Wear, the ZenWatch 2's most compelling feature is a new magnetic cable charger that locks into the back of the case, much like an Apple MagSafe power connector. The watch will have roughly double the battery life of its predecessor, and a charge will power the device for three to four days, an Asus spokesman said. 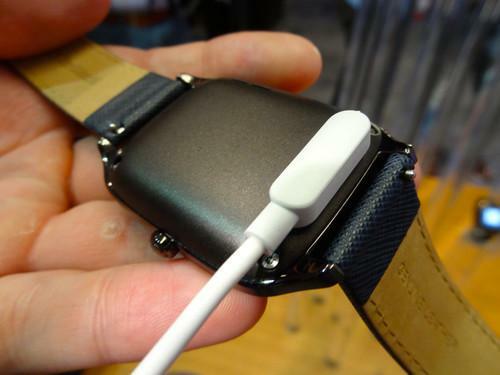 The optional battery attaches to the back of the case, fitting between the watch's underside and the user's wrist. The add-on could give the watch another half-day or night of power, but it will only be available for the men's version of the watch. The ZenWatch 2 will have sensors that can be used with an improved version of the Wellness app that also came with its predecessor, but Asus would not give details. The remote camera function of the first-generation watch, which shows the camera view from a paired smartphone, now works faster and can switch from the phone's front and rear cameras. It can also zoom in and out. More details about the ZenWatch 2 will be released in the third quarter, probably at Germany's IFA tech expo in September.